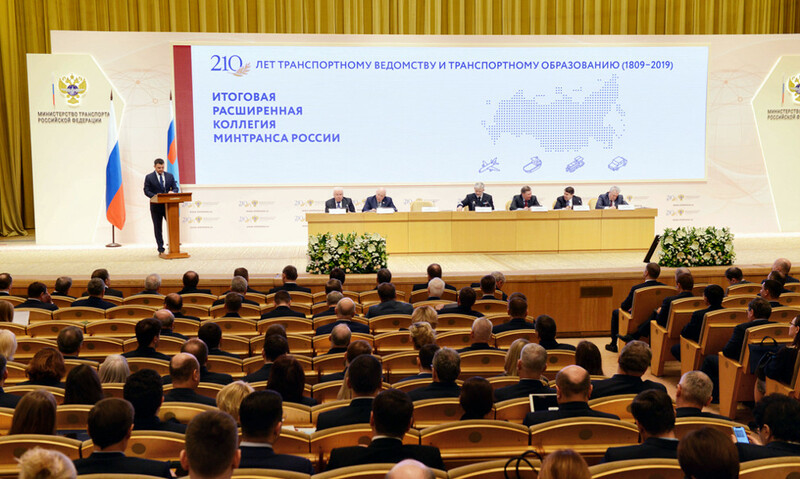 The governor of Yamal-Nenets Autonomous Okrug Dmitry Artyukhov participated in the final extended collegium of the Russian Ministry of transport. Reports on it were made by the deputy chairman of the Russian government Maksim Akimov, the Minister of transport Yevgeniy Dietrich, the Aide to the President of the Russian Federation Igor Levitin, the director general, the chairman of the Board of “Russian Railways” Oleg Belozyorov, representatives of the Federation Council, passenger companies, scientific community and business. The collegium summed up the results of development of transport infrastructure in 2018 and outlined the tasks for the future. They include increase in cargo traffic along the Northern Sea Route, providing of transport connectivity of the country, increase in safety and comfort of passenger traffic. Among the largest projects to be implemented in Russia in the coming years there is the project of Yamal on construction of the Northern Latitudinal Railway. “Development of the Northern Sea Route, the cargo flow through which is planned to increase up to 30 million tonnes by 2021, is the strategic objective. It will be provided owing to transportation of natural gas, gas condensate, coal and oil from the ports of Sabetta, Dikson and Dudinka, use of transit potential and involvement of cargo base through construction of the Northern Latitudinal Railway”, Yevgeniy Dietrich said. According to Maksim Akimov, implementation of the project on development of the Northern Sea Route also opens up great opportunities for our partners in machine building. Their task is in fulfillment of a technological breakthrough: pass-through digitalization of processes, management of product lifecycle. Development of air transportation and modernization of airports were also named among the priorities. Reconstruction of the airport in Noviy Urengoy will be started this year in Yamal. For the first time in Russia such project will be implemented under the concession agreement, as the press service of the head of the region reports. Following the results of the collegium, the governor of Yamal told that in the coming years the region would have a lot of work to create modern infrastructure for cargo and passenger transportations. “The Northern Latitudinal Railway was included in all the necessary strategic documents and was marked in all the speeches as the key project for the coming years. Also our plans on development of the port of Sabetta, its transformation into the universal port in connection with construction of the Northern Latitudinal Railway-2, which is now being actively discussed, were marked. Tasks on development of aircraft, especially in remote areas, were set. Yamal has positive experience – it is not only the project on reconstructing of the airport in Noviy Urengoy, but also on subsidizing of air travels. New subsidized routes are appearing, it allows making flights more affordable for residents”, Dmitry Artyukhov said.